surprisingly i have yet to see some VCU themed band aids. 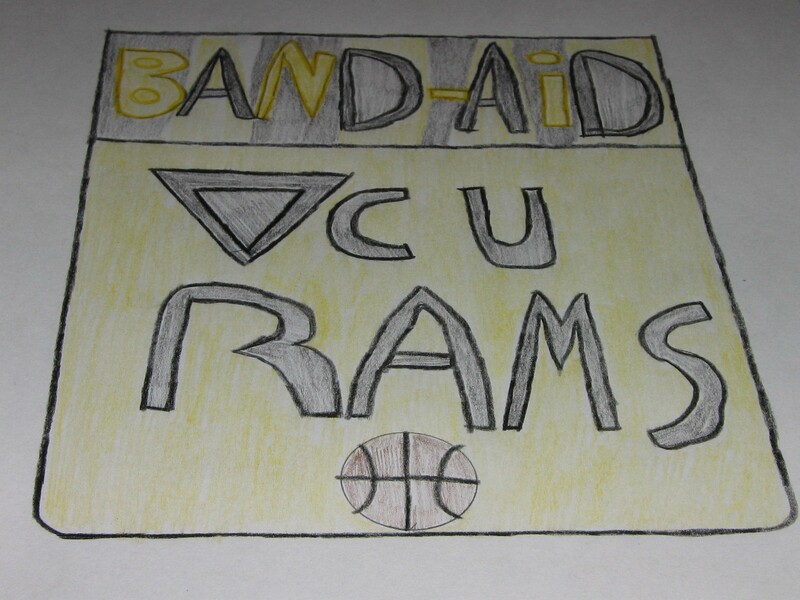 the idea here is to have a special limited edition of VCU Rams band aids! i am not much of an artist as you can see from my bubble letters. not too bad for colored pencils and a straight edge. i drew the basketball on here since most people who aren’t affiliated with VCU would most likely associate us with our basketball team. i used the traditional black and yellow colors and outlined the letters with a light shading inside of them. the first couple attempts at this drawing didn’t turn out so well mostly with the letters. This was my 3rd attempt at the drawing and the letters were much more legible this time. i thought this idea would be a success around campus since students and alumni are always looking for new VCU themed products or apparel. This would be a first! it can also be associated with our school’s first final four appearance. It was an experience of a lifetime for a our school and these Ram Band Aids could be a great experience too. GO RAMS! !